Winter Photography, February 3. Boston Nature Center. Images and reading materials. Nature Photography Fall Colors, Boston Nature Center, October 7, 8:00 am - 10:00 am. Images and reading materials used for this workshop. Bird Photography Series, Joppa Flats. September 9-30, Saturday mornings. Images and reading materials. Bird Photography Workshop, August 13, 2 - 4:30 PM. Images and reading materials. Bird Photography Series, Boston Nature Center. April 8-29, Saturday mornings. Images and reading materials. Bird Photography Workshop, Joppa Flats. September 25 Sunday afternoon. Hands-On Bird Photography Series, Joppa Flats. June 4-25 Saturday mornings. Images and reading materials. Bird Photography Series, Boston Nature Center. January 9-30, Saturday mornings. Bird Photography Workshop, Boston Nature Center. January 8, Images and reading materials. Bird Photography Workshop, Joppa Flats, September 26. Images and reading materials. Bird Photography Workshop, Boston Nature Center. August 22 Images and reading materials. Bird Photography Series, August 9 - August 30 Images and reading materials. Nature Photography Spring Colors, Boston Nature Center, April 18, 2015 8:00 am - 10:00 am. Images and reading materials used for this workshop. Nature Photography Winter Light, Boston Nature Center, January 24, 2015 8:00 am - 10:00 am. Images and reading materials used for this workshop. Nature Photography Workshop, Fall Foliage Series, Boston Nature Center, October 18, 2014 8:00 am - 10:00 am Images and reading materials used for this workshop. Bird Photography Workshop, Joppa Flats Audubon Center, September 21, 2104 2:00 pm - 4:30 pm Images and reading materials used for this workshop. Nature Photography Summer Series, Boston Nature Center, August 2, 2014 8:00 am - 10:00 am Images and reading materials used for this workshop. Nature Photography Spring Colors, Boston Nature Center, May 24, 2014 8:00 am - 10:00 am. Images and reading materials used for this workshop. 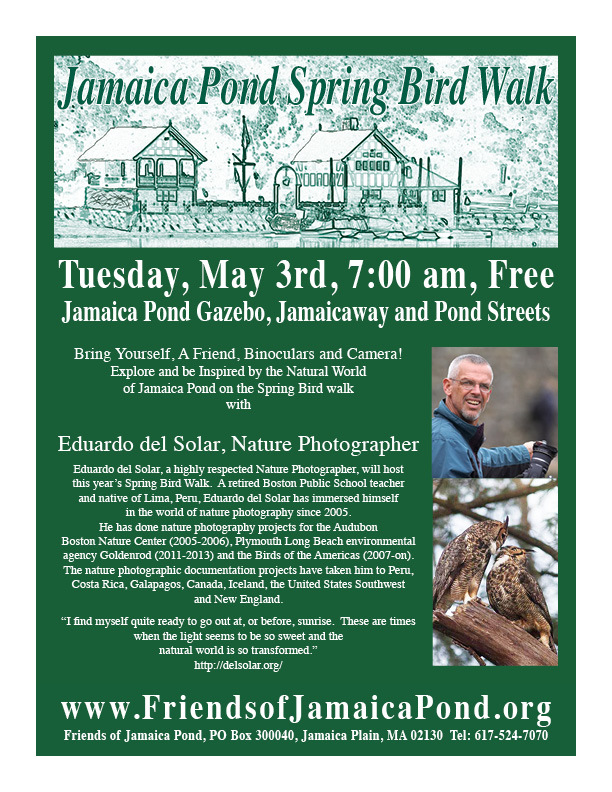 Introduction to Avian Photography, Viles Arboretum, Augusta Maine, May 10, 2014 8:00 am - 10:00 am. Images and reading materials used for this workshop. Nature Photography Winter Light, Boston Nature Center, Feb 01, 2014 8:00 am - 10:00 am. Images and reading materials used for this workshop. For hours and availability please email me. Usual charges are $50 for a 45 minute class of individual instruction.